Clips is exclusively available to iOS devices (iPhone, iPad and iPod Touch), and you can download it from the App Store here. It’s difficult to say which app Clips most resembles. 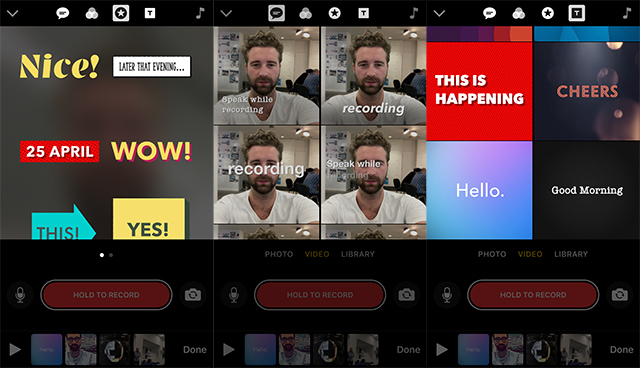 It’s a bit of mix of old favourites, like Snapchat and Instagram, but features elements of proper video-editing software, a bit like a stripped down iMovie. It lets you stitch together videos, both brand new and older ones you’ve got saved in your gallery, to create miniature movies to share with family and friends. The app is much more than a new video-editing tool. It lets you add animations, stickers, and filters to all your videos. And you can dictate speech to text live, using a tool called Live Titles, without having to type a word. This tool is the without doubt the headline, and is really useful when you consider that a lot of social media users, especially the Facebook community, are watching more videos with the volume turned off. It doesn’t get absolutely every word, if you’re talking quickly or have a strong regional accent, but this is to be expected from a technology that’s still finding its feet. You can also add a load of pre-installed soundtracks, which are available directly within the app. You can’t upload stuff from Spotify or iTunes, however, but this is probably down to copyright issues. Another aspect we enjoyed was Clips’ ability to recognise who’s in your videos. If you’ve previously tagged friends in your photos app, it’ll spot them and recommend you share it with them once you’re finished. Neat. Clips is a great app if you’re into producing creative short videos, and it’s a sensible decision by Apple to not have it as a new platform, like Twitter’s Vine, for example. By making Clips a standalone-editing app, there’s no reasons for iOS user to commit to yet another social media channel when there are already established favourites out there. We love Apple Clips, and we can’t wait to see how creative the community can be. Have you used Clips yet? Tell us what you think of Apple’s most recent app in the comments section below.